Place your mouse pointer over the file and click once: Mac OS X darkens the icon to indicate that it’s selected — a mysterious process called highlighting. Type the first few letters of the icon’s name: After you type a letter, Mac OS X highlights the first icon that matches that character. If an icon in a window is already highlighted, you can move the highlight to the next icon across by pressing the right-arrow key: Likewise, the other three arrow keys move the highlight in the other directions. If an icon in a window is already highlighted, you can move through the icons alphabetically by pressing Tab to go forward and Shift+Tab to go backward. If the icons are next to each other, click and drag within the window (and not directly on a specific item) to highlight them all. While you drag, Mac OS X displays a selection box, and any icons you touch with that box are highlighted when you release the mouse button. Think “lasso” and you’ll get the picture. 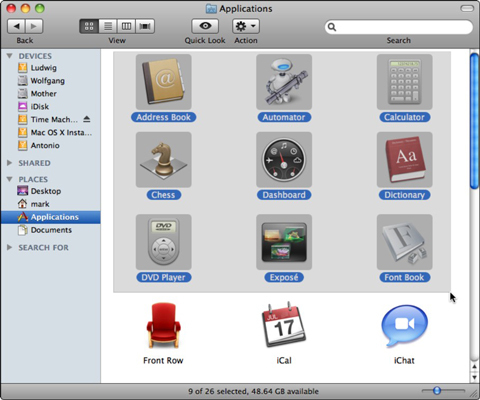 Dragging a selection box in Mac OS X. You can also select multiple adjacent icons by clicking the first item to highlight it and then holding down the Shift key while clicking the last icon in the series that you want to select. If the icons are not next to each other, hold down the Command key while you click each item that you want to select.